Well I just played the original. Day X. So, can't wait for this sequel! Great stuff guys, I like seeing your progress. Original game was fun too! Stuck with a little problem! I don't actually know anything about Unity3D, but looking at your shader code, it looks like it doesn't have a fragment shader. You are using a vertex shader, and a surface shader (that it looks to me that is something like a post processing pass). If it is so, you should write a fragment shader where you can discard the fragment, or depending on the alfa valua set the depth to the maximum value. A surface shader (that it looks to me that is something like a post processing pass). The surface shader is Unity's magical mysterious equivalent of (everything including) a fragment shader. It is evaluated per pixel and it is (I think) compiled to a frag shader plus some other junk. I didn't know it was possible to set depth values explicitly! However, that still wouldn't solve my problem: I don't want to "overwrite" the existing depth value (even with 0), I want to leave the depth value alone for certain pixels (the ones that are transparent on sprite). Actually, everywhere I read it says that AlphaTest should prevent anything from being written to either frame or depth buffer. That's exactly what I want. I am thinking now that perhaps my code works, but one of Unity's magical mysterious lighting passes is still writing to the depth buffer. Long explainy type post time! So, spent a few days fixing up the shader that we use for water, and I get asked regularly how it works, so I'll try to explain in some detail. So far so good, Also, have a look at this great explanation by Emanuele Feronato. : Note: in Unity, "fetching a part of the screen" requires rendering the entire game to a texture first (a Pro feature). We were doing that anyway in order to get pixel-perfect upscaling. In order to make the water look dynamic, I simply scroll the heightmap (by modifying the texture offset in Unity). Without any extra refinements, the result would look a little like the following: (tweaking the scroll speed and displacement values will actually make it look acceptable). The water doesn't really look like a horizontal surface because there is no perspective correction of the waves. It is easy to spot that a texture is being linearly scrolled. So, let's fix some of these! Unfortunately this operation has to go in the fragment shader instead of the vertex shader, because the uv interpolation is affine. (Yes, graphics cards actually do perspective correct texturing, but only if your shape is actually in perspective, and not a camera-facing quad. This is a typical situation where faking 3D in 2D gets messy). On to point two! Let's make the water look a little more chaotic. Generating Perlin noise on the fly would still be an option, but I found another workaround. You might have guessed it from the fact that all my code mentions "displacement1": I simply use multiple displacement maps overlaid. I generated another normal map that has a higher level of detail, and for each pixel I add the offsets together. Additionally, I scroll the displacement maps at different speeds. Then I added some ambient multiplier based on the waves and I did some math magic to get nicely "rolling" sparkles. Now I'm afraid it looks too "hi-fi" for a pixelart game. This water might just be the best water in a 2D game I've seen. Showed my brother, he agrees. That is some amazing water.. Played the demo. Really nice atmosphere and mechanics. The tired horse had me screaming at times. Got super addicted before I was caught out at work. Backed this KS and so glad to see this game is still around. Looking amazing. Have you timed how big is the win for having the normal map pre-rendered in a texture? I thought that texture fetches in a shaders were more expensive that the actual math operations. I haven't! I always thought texture lookups were kind of cheap (I guess I equated lines of code to performance ) ! These are favorable conditions though: very small textures with lookups of neighboring fragments accessing neighboring texels. Wow, I'm late to the game but the water looks amazing. Gives it a very unique touch too. The objective: For an intro sequence of the game that foreshadows the theme, we want the player to encounter big, stone-built letters spelling out KINGDOM that crumble as the player passes, leaving only inrecognizable ruins. There are many options for realizing this, such as frame-by-frame animation or using the physics engine. These kinds of problems that ask for a hybrid of engine This post attempts to explain the problems and method that we ended up using, with many pictures of course! Before investing a lot of work into anything elaborate, we tried the most naive method to see if we're headed in the right direction. The movie below shows the letters animating independently, sliding out of view or toppling, covered up by simple particles. This is obviously very crude, but it does show that even basic particles can cover up a cheap animation. Also, the letters themselves need a lot of work. The animation above is nice but we want the letters to actually crumble. My first thought went to somehow slicing the letters dynamically, in real-time. 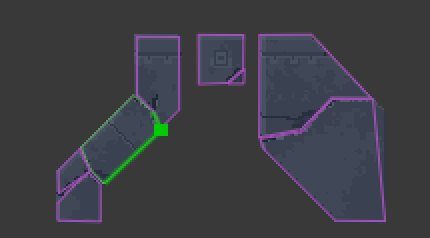 Subdividing the collider polygons would be doable, but I would have to somehow subdivide the sprites and map the texture correctly to the fragments. Unfortunately this is a bit of magic that is abstracted away under the SpriteRenderer. 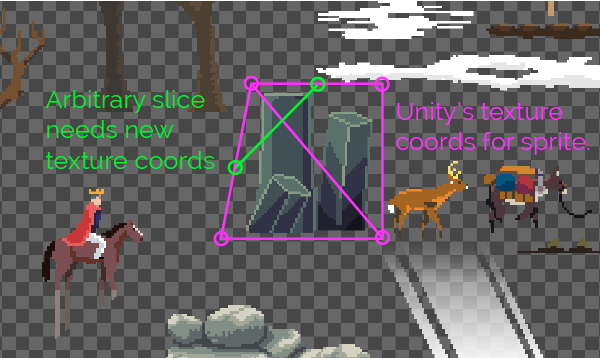 I would need the original texture coords (the pink polygon) to compute the sliced coords (the green line). Sprite.textureRect: Get the rectangle this sprite uses on its texture. Raises an exception if this sprite is tightly packed in an atlas. And we definitely do (and need to) pack our sprites tightly into the atlas! So it seems there is no way to recover the coordinates of the sprite on the atlas. Dead end. EDIT: It seems I overlooked Sprite.triangles. Was this property exposed before Unity 5? It's great though! That would allow dynamic slicing of packed sprites. Okay. If the dynamic code-driven route is unavailable, it's time to do some actual work: let's make each fragment a sprite of its own. Then we'll figure out how to animate them later. The first problem I encountered was this. Even if I can draw the cracks, it still is a PITA to extract fragments into separate images or layers. And I would have to repeate that process every time I changed a single pixel. So! I dug up my old Python and Numpy and I wrote a script that would split the sprite automatically based on Connected Components. I like this because it still feels like I'm avoiding actual labor! Each sprite is saved on a transparent background that is the size of the original sprite, this makes aligning them all inside of Unity easy! 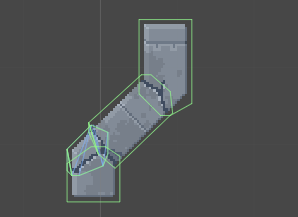 When simply dumping all the sprites into Unity and adding a PolygonCollider2D, Unity adds colliders that are roughly the shape of the sprite. However, this will not do at all since those colliders will overlap, causing the fragments to 'explode' as soon as physics simulation starts. So I wrote a little script that draws Gizmo lines for all colliders in a group even while editing one of them, so that I can precisely align the polygons. 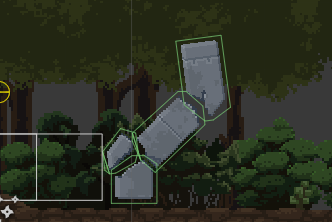 Finally, I don't want all the fragments to crumble simultaneously, so I added an Animation that controls the "isKinematic" property of each fragment. This was kind of a hassle to do right since it's not a real animation. The physics simulation has to run for the pieces to move, so it is impossible to preview in the editor and it is impossible to rewind. And there you go: crumbling letters. It took manual cutting and sequencing, but with a little help from the physics engine. It needs particles and more grime and vines and whatnot, but I'm very pleased with the results, we might use the same technique for other destroyed buildings too!